While the honeymoon blanket was absolutely fantastic for hammock knitting, I had a smaller, more mindless project tucked away in my bag for airport and airplane knitting. Pattern: simple 56-stitch stockinette sock with a picot edge (à la Claudia) and short-row heel (à la Cat Bordhi ). Yarn: Sock Hop Yarn, 100% superwash merino, two skeins of Ain’t No Mountain High Enough, handspun and hand dyed by the talented artists at Crown Mountain Farms. Needles and gauge: 7 sts/inch and 10 rounds/inch using Susan Bates US 1 dpns from this set . The yarn is everything it’s hyped up to be: soft, colorful, captivating, texture-rich and remarkably sturdy (I frogged a few times before getting the circumference just right). And even with two grandma-sized socks eating up 98 grams of yarn, I have 45 grams of yarn left over! That is, 2 skeins of Sock Hop Yarn are enough for 3 average-sized socks! But here’s the amazing thing… the ridiculous thing! Sock Hop Yarn is the second! I put on those socks, and I did not feel the urge to rip them off five minutes later! If you’re sensitive to wool, you know what I’m talking about. Seeing that this yarn is 100% wool, I’m convinced that it’s not only the specific type of wool that determines whether a yarn is tolerable to me; it also must be the way the fiber is processed and/or spun! Whatever it is, Sock Hop Yarn gets a “thumbs up” from me and joins the previously-lonely Baby Cash category. Mmm-hmmm! And, as I mentioned, I have 45 grams left over… maybe I can finally score myself a pair of wearable wooly anklets?!? Very pretty socks! Somebody once told me that rather than picking and combing that some companies use a chemical bath to dissolve dirt and vm. If this is true then possibly the cleaners are to blame. I’ve not researched this claim though. Thank you for the calf-shaping tips. I left this first pair as is (experiment of sorts) and I’m planning a second pair following your advice regarding placing the decreases. Oh, I’m so glad you posted this today because Crown Mountain Farms had a shop update today, and I got some of the Sock Hop yarn! I’ve never been to their site when yarn is available before. Your pair is lovely, and YAY for finding wool yarn you can wear! 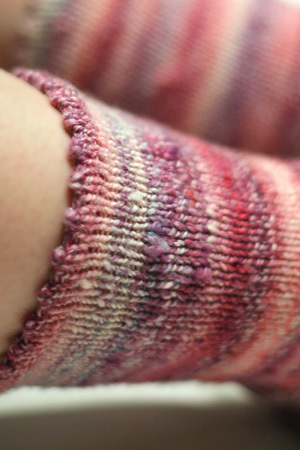 Oh gosh…I have some Sock Hop in my stash that has been waiting for the right project (it seems too pretty for socks! And I was worried being handspun that it might be too fragile, glad to hear it’s sturdy!) and seeing these knit up makes me want to cast-on for something immediately! So cozy! those are some cute socks. Good to know, honeymoons cure wool itchies! Very nice! The picot edging adds a nice sweetness to the socks. Your picots are perfect. Top-down or toe-up? Will you share how you formed them? That’s great! Finally got yourself a wool yarn you can wear … go get more and knit yourself some gorgeous socks. Hi, delurking to say YES! How fleece is prepared makes a great deal of difference in the end yarn. My husband cannot tolerate most wools; however, I made him a scarf by carding the fleece, spinning the yarn, and dying the yarn using natural materials. He can wear that scarf with no problem. A lot of commercial wool is processed using a weak sulfuric acid bath to get rid of vegetal matter, which roughens the scales and produces the itch. Wool that is not subjected to rough handling is often a lot softer and less itchy. I’m glad you found a wool you can tolerate! As a fellow wool itcher, I understand the woe. Merino itches much less to me while angora, alpaca and even most cashmere makes me dance in agony. Another thing to think about is the dye. Some dyes react with the yarn differently, creating a more itchy fabric. I really really like these socks. Beautiful yarn, and the picot edge is so cute! There’s a very simple explanation – handspun is magic. It truly is. I didn’t get the sock knitting bug until I finished my first pair of handspun socks. Now I got to get moving on more spinning! Socks are just loverly btw! What lovely socks. I’m on a self-imposed yarn buying hiatus… so no new yarn for me… but that stuff is going on my list for ’09. Over how many stitches do you work your short row heels? I usually use 50% of my total stitches, which works well for my foot, but perhaps not for everyone. Your sock looks like you used less. I always love your sock photos! Oooh, temptress. I just clicked away from their site too. I may have to reconsider. This is amazing….wool socks that you don’t hate! Those socks are simply stunning!! I love the way those colors stripe…sweetness! 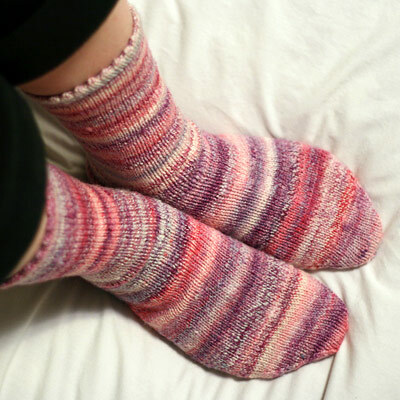 Your socks and the yarn just goes to show you, that you don’t need a fancy pattern to have a gorgeous pair of socks!! Awesome! Thanks for the tip about the yarn. Oooooo! Pretty! I love seeing how this yarn knits up. Oooh, those are gorgeous! The yarn is SO pretty. And I am so happy to see you have given it such a rave review; like Kristy above, I ordered some earlier today. Now I can’t wait for it to get here! Very nice socks! I’ll have to try Sock Hop. Those socks are stunning! I love the color, the plain stockinette suits it well, and the picot edge is just icing on the cake. Gorgeous! I think I love your husband! OK, one knitting project on the honeymoon was fantastic! But MORE THAN THAT! Marry that Man! Oh, wait, you did! Hooray for the husband!! Lovely socks and blanket btw. Wow! That is an amazing yarn and those are lovely socks. I’m so glad that you enjoyed the yarn – it was such amazing fun to create. The colors are all new now, since I am no longer part of that business, but many of the hand spinners are still the same wonderful folks. It takes about 20-25 hours to spin enough yarn for three pairs of socks. And every one of the people who used to spin for me deserves a big round of applause for their fabulous work! They are a great bunch. Oooh – those look so comfortable and the colors are just scrumptious. Thank you thank you thank you for posting pictures of your finished Sock Hops. We sock hop spinners love to see the finished product!! Not only is this a wonderful wool to wear it is a dream to spin, it is so soft to the hand. I’m glad to hear how happy you are with your socks and happy that we got to be a little piece of your honeymoon. Just a tidbit in case you’re looking, but I found that Joan McGowan-Michael’s Lacy Summer Socks used very little yarn–I made a pair out of 50g of SeaSilk and plan on making another pair out of the half skein leftover. Of course, how the lace pattern and the stripes go together might not be your favorite. I love those socks! Beautiful colors, and they look so comfortable. The processing makes all the difference! Most people who are sensitive to wool are actually sensitive to the chemicals used in commercial processing, which is why they also can’t wear non-sheepy wool like alpaca. People who are actually allergic to sheep are allergic to it like someone would be allergic to cats or dogs. They get all sneezy, watery eyes, hives, etc. Good handspun is a million times better than any millspun yarn. It makes me want to hit people over the head with a spindle when they say things like “you can’t weave with handspun” or “I was worried being handspun that it might be too fragile”. Spinning machines are trying to recreate what a skilled spinner can do with fluff and a stick, and they will never get it right. Ever wonder why millspun angora sheds? Because it’s cheaper to put less twist in yarn, so when you get a short fiber like angora it falls apart. Those socks are gorgeous. Love, love, love the yarn. Nothing says “Happy Valentine’s Day Grandma” like a delicious pair of socks! What a lucky lady. One question: How did you knit with metal needles in the plane??? Second: This socks are so sweet. I just love them!!! I am glad you got a post from the magic dyer herself–Teyani! I also think that superwash wools are generally softer than non, they also take dyes differently. That may just be a pair of socks of yarn that I spun… I have done that colorway before, so it makes me excited and glad that they are so appreciated! I don’t spin for CMF anymore, life just gets to much in the way, but I sure did love Teyani’s colorways. it amazes me you are allowed to knit on airplanes! in Oz even the chopsticks i use to keep my hair up have to be hidden when crossing through security points! and the itch factor is something that Oz merino breeders have been consciously ‘breeding out’…so if you use superfine low-itch merino and only dye with natual dyes (avoiding alum as a mordant, it roughens the wool) and especially using eucalyptus, which coats the wool and makes it more felt-resistant…you should have a pretty cosy product. anyway your sox are gorgeous! Such a nice pair of socks!! I love the fact that they are simple and neat!!! You definitely know how to take advantage of your time, you are a big inspiration!! I picked up some Sock Hop at a fiber festival last week and this post is making me especially eager to give it a try. I picked up leftover skeins in three different colorways (http://www.flickr.com/photos/chavala/2275965981/), about 600 yards total, and am thinking about a shawl. Since all I want to do these days is knit a shawl. Oooooh! ooooh!ooooooh! My god, I am so excited! I randomly clicked on this picture because I liked the colourway, but you’re another who can only stand baby cashmerino, and you say this yarn works, too?